Victory Gardens Theater on September 9 – October 9, 2011. Featured in this video: Polly Noonan, Kate Fry, Mark Montgomery. Victory Gardens Theater is a theater in Chicago, Illinois dedicated to the development and production of new plays and playwrights. The theater was founded in 1974 when eight Chicago artists, Cecil O’Neal, Warren Casey, Stuart Gordon, Cordis Heard, Roberta Maguire, Mac McGuinnes, June Pyskaček, and David Rascheeach fronted $1,000 to start a company outside the Chicago Loop and Gordon donated the light board of his Organic Theater Company. The theater’s first production, The Velvet Rose, by Stacy Myatt premiered on October 9, 1974. The company’s initial home was on the top floor of the Northside Auditorium Building, 3730 N. Clark Street. Its second production—a country-western musical co-produced with commercial producers called The Magnolia Club by Jeff Berkson, John Karrakerand David Karraker — was the company’s first hit. In 1975, director Dennis Začek staged The Caretaker by Harold Pinter, beginning a relationship that led to Zacek being named artistic director in 1977. Key on-going collaborators worked with the company for the first time in the Clark Street space, including actor William L. Petersen, Marcelle McVay, director Sandy Shinner, and playwrights Steve Carter and Jeffrey Sweet. All of these people continue relationships with the company today. McVay, who is married to Dennis Zacek, subsequently became managing director and Sandy Shinner later became associate artistic director. In 1981, the success of Sweet’s third play with the company, Ties, led to it being transferred to an extended run in the larger space downstairs at the Body Politic Theater at 2257 N. Lincoln. When Ties closed, downstairs became Victory Gardens’ new home. Upon the demise of the Body Politic company some years later, Victory Gardens acquired the whole building, housing four stages. In 1989, Začek’s staging of James Sherman’s Beau Jest was such a hit that it moved for a long run off-Broadway and was subsequently staged in hundreds of productions around the world. In 2008, Sherman released a film version of the play starring Lainie Kazan and Seymour Cassel. In 1997, resident playwrights Steve Carter and James Sherman were joined by Claudia Allen, Dean Corrin, Lonnie Carter, Gloria Bond Clunie, John Logan, Nicholas Patricca, Douglas Post, Charles Smith, Jeffrey Sweet and Kristine Thatcher as the founding members of the company’s Playwrights Ensemble. In 2001, Victory Gardens received the Tony Award for Regional Theatre, one of four Chicago companies to be so honored the other three being the Steppenwolf Theatre Company, Goodman Theatre, and Chicago Shakespeare Theater. 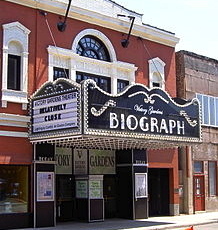 In 2006, Victory Gardens opened a re-designed Biograph Theater at 2433 N. Lincoln Avenue as its new home. 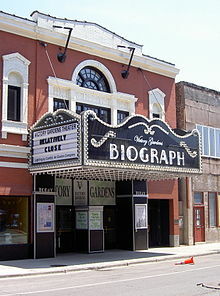 The Biograph, the notorious location of the ambush of gangster John Dillinger, opened with a party hosted by William L. Petersen, who played Dillinger at Victory Gardens at the beginning of his career. The space at 2257 N. Lincoln has been redubbed the Victory Gardens Greenhouse and is mostly rented to a variety of non-profit companies including Shattered Globe and Remy Bumppo Theatre Company. In 2008 the Victory Gardens Greenhouse was sold to the Wendy and William Spatz Charitable Foundation. It is now the Greenhouse Theater Center. In 2010, Victory Gardens named the studio space at the Biograph Theater the Richard Christiansen Theatre in honor of longtime Chicago Tribune theatre critic Richard Christiansen, author of the book A Theatre of Our Own.